Intimate and exquisite, Hidden Valley Inn is a luxurious resort set tucked within a vast private reserve accessible only to our guests. A perfect sanctuary of nature and creature comforts, this magical retreat celebrates the serenity, beauty and wildlife of its Belize jungle setting. 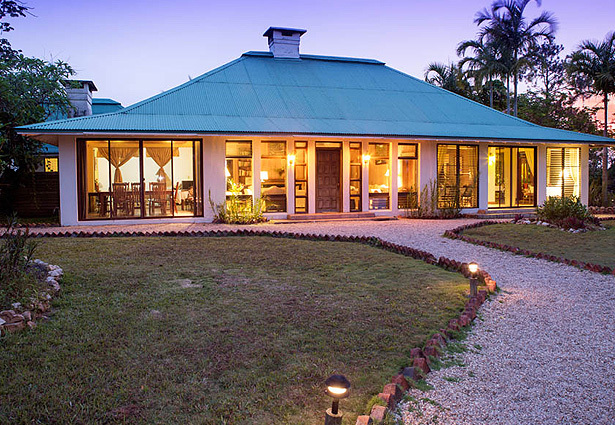 Set in the Mountain Pine Ridge area of the Cayo District of Belize, Hidden Valley Inn’s twelve cottages are beautifully appointed and feature a host of services and amenities. From the cozy lounges with stone hearths and the mahogany bar room to the pool terrace and surrounding tropical gardens, Hidden Valley Inn exudes the comfort and elegance our guests expect and the sense of adventure and discovery they cherish. Welcome to a sanctuary of nature, serenity and adventure. At Hidden Valley Inn, the beauty of the surrounding wilderness blends seamlessly with the elegance of our plantation-style cottages, Mayan-influenced cuisine thoughtful amenities. In the mid-1970’s, the estate house of Hidden Valley Inn was built by Julian “Bull” Headley as a family vacation home. Designed for elegant yet casual comfort, the lodge included airy ceilings, open space and several fireplace lounges for cooler mountain nights. It remained in the family for over thirty years until 2001, when the Roe family purchased the lodge, restored and renovated it to its current state.